a b s t r a c t Pulsed plasma arc additive manufacturing (PPAM) is a novel additive manufacturing (AM) technology due to its big potential in efﬁciency, convenience and cost-savings comparing with other AM process. In this research, several Ti-6Al-4V thin walls were deposited by an optimized weld wire-feed PPAM process, in which the heat input was gradually decreased layer by layer. The deposited thin wall consisted of various morphologies with different microstructure, such as epitaxial growth of prior β-grains, martensite and horizontal layer bands of Widmanstätten, which depend on the heat input, multiple thermal cycles and gradual cooling rate in the deposition process. Reducing heat input of each bead and using pulsed current in the PPAM process, the microstructure of thin wall was reﬁned. Meanwhile, the thin wall was strengthening and toughening. The average yield strength (YS) and ultimate tensile strength (UTS) reach 909 MPa and 988 MPa, respectively, and elongation reaches about 7.5%. The thin wall exhibited excellent performance in the aeronautical applications owing to the high values of mechanical properties in the room temperature. 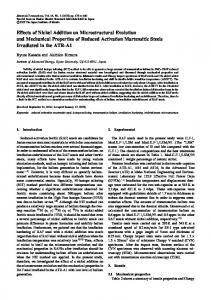 © 2016 Published by Elsevier Ltd.
http://dx.doi.org/10.1016/j.matdes.2016.04.018 0264-1275/© 2016 Published by Elsevier Ltd.
was 2000 × 1500 × 8 mm (length × width × height) hot rolled plates. The plates were grounded by 150 to 400 grit SiC papers and then degreased by acetone and ethanol before being used. A TransTig 4000 Job G/F and A Plasma module 10 were used as the power supply with a KD7000 D-11 wire feeder. The plasma arc welding head was attached to a 6-axis KUKA robot linked to a 2-axis table. The PPAM process was carried out with inter gas (argon) shield. (+) = Good, (0) = neutral, (−) negative, and (− −) more negative. Fig. 1. Schematic representation of the plasma arc deposited process (a) and measured current (b). Fig. 2. Schematic drawing of thin-wall deposited by PPAM process. The peak current of pulsed plasma arc. The base current of pulsed plasma arc. Duty cycle. Average of current is equal to Ip × Dcy + Ib × (100% − Dcy). Fig. 3. The proﬁle of Ti-6Al-4V wall shows (a) the columnar prior-β grains, layer high and morphology of layer band, (b) the top region, (c) the middle region and (d) the bottom region. colony α, or a part of colony α grow along the prior β-grain boundary in the top region. The sequential deposition of layers has repeatedly melted, and been heat treated in the middle region of the wall, contributing to specially characteristic microstructure. Orientation map shows the orientation relation between different α lamellae with different color and different orientation. Generally, parallel neighbor lamellae seem to fuse together and form a larger region (or α colonies), which are called relatively large grains in the orientation map. As shown in Fig. 6, the Y–Z plane in the middle region represents prior β grains at triple point, while Fig. 7 shows the internal prior β gain area from the middle region. Different orientation prior β grains include martensite α′ structure and basket-wave structure, which can be evaluated by different microstructures (Fig. 6a). The distribution of misorientation observed in Figs. 6a1 and 7a1 tends to be about 60 deg. Fig. 4. Microstructure of layer band region in the middle region of the deposited wall, (a) optical microscopy, the points indicate different place of the EDS micro-analysis; (P1), (P2) and (P5) SEM photos showing two different microstructures. measurement result is shown in Fig. 8c, which almost matches the hardness level of ASTM B367-13 . Specially, the microhardness in middle LB (Fig. 8c, marked by single arrows) is slightly lower than that in the upper LB and the lower LB, but it gently increases near the secondary LB. properties (Table 5). However, the strain of failure is lower than some others typical AM technologies via stress-relieved or annealed conditions. The mechanical property can be summarized as higher strength but lower ductility in as-built condition. Fig. 9 shows the SEM fractograph of typical tensile test at the bottom region and the middle region. The coupons present typical fractograph of dimple rupture shown in Fig. 9a1, b1. The arrows without ﬁlled back line are used to note the crack growth orientation. It can be seen that the crack growth at the bottom is aligned with additive deposition (i.e. Z direction), while the crack growth in the middle is vertical to the fracture surface (i.e. Y direction). With respect to the shape and depth of the dimples, the fractograph of the coupon shows elongated dimples and tear ridges (Fig. 9a1, noted with white arrow). In addition, the rupture surface of the middle region shows mixture of coarse and ﬁne dimples, which are larger and deeper than those of dimples of the sample in the bottom region (Fig. 9b1, noted with white arrow). 4. Discussion 4.1. Microstructural characteristics 4.1.1. Evolution of the columnar grains and the layer bands The AM process fabricates a component by means of direct energy input to melt the previous deposition layer. Heat input has a signiﬁcant effect on thermal gradient, nucleation and the growth rate of grains. Prior β-grain varies in shape from nearly globular to large columnar, and perpendicularly grow up across multiple deposition layers. Such phenomenon of perpendicular strip of columnar prior β-grains was also observed in the laser additive layer manufacturing (LAM) or weld wire arc additive manufacturing (WAAM) [27,34]. Fig. 10 shows proﬁle of Ti-6Al-4V wall deposited By PPAM, including one layer, three layers, four layers and single bead, respectively. Fig. 5. Optical micrograph of normal microstructure compared to layer band of the wall from (a) the bottom region; (b) the middle region; (c) the top region. Fig. 6. The EBSD of grain boundary at triple microstructure from the middle region of the wall. (a) Orientation map with inverse pole ﬁgure; (a1) the distribution of misorientation angle; (b) unique grain color map; (b1) grain size distribution; (c) image quality;(d) distributed phase map. Fig. 7. The EBSD of internal grain from the middle region of the wall. (a) Orientation map with inverse pole ﬁgure; (a1) the distribution of misorientation angle; (b) unique grain color map; (b1) grain size distribution; (c) image quality; (d) distributed phase map; (e) pole ﬁgure. Fig. 8. Schematic illustration of hardness measurement on the proﬁle of the wall (a and b); microhardness of layer bands (bottom, middle and top region) of the wall (c): the zone of within LB was marked by single arrows; ASTM B367-13 was marked by dashed line. H means horizontal; V means vertical. Fig. 9. The SEM fractograph of typical tensile test at room temperature: (a, a1) the bottom region; (b, b1) the middle region. Fig. 10. Coupons produced by PPAM: (a) 1 layer is 1.7 mm high; (b) added3 layers is 3.7 mm high; (4) added 4 layers is 6.4 mm high, the columnar prior-β grains growth directions are indicated by arrow. nucleation can easily occur in the front of dendrite growth, as shown in Fig. 11. In the case of the two reasons above, there appear different orientational grains. Consequently, the PPAM process can effectively reduce the average length-width ratio of the columnar gains, and force the prior β grains to growth epitaxially in a row from bottom to top. That means the PPAM process can be substantially reduce the anisotropy to the deposited components, as shown in Fig. 11. Fig. 11. The effect of pulse frequency on the freezing range (ΔT). A constant temperature gradient G and cooling rate are assumed. Fig. 12. α and β phase orientation map of pole ﬁgure. Fig. 13. Schematic stereographic projection in typical four cases of hexagonal system. the occurrence of elongated dimples or tear ridges in fractograph (Fig. 9a1). 5. Conclusions The Ti-6Al-4V thin wall deposited by the advanced weld wire-feed PPAM process exhibits excellent mechanical properties. The following results are obtained from the systematic investigation on the microstructural evolution. v means deposited speed. a Power of plasma arc. b Rate of heat input. (1) Both of the size and growth direction of prior β grains are affected by the gradually reduced heat input of the pulsed plasma arc. (2) The formation of horizontal LBs is subjected to the inﬂuence of four thermal cycles at least in the PPAM process, and insufﬁcient thermal cycles lead to the absence of LBs in the top of thin wall. (3) The phase transformation follows the Burgers orientation relationship, and three orientations out of the twelve possibilities occupy dominating orientations, which ﬁnally form triangular stars or rhombic patterns. (4) The low hardness of LB and relatively low elongation are caused by the formation of α colonies. However, the mechanical properties of the deposited wall at room temperature exceed the standard of casting wall, and the strength is even higher than that of forged wall. Acknowledgments The research is performed with ﬁnancial assistance from the military plan projects of China, No. 613213. References  C. Leyens, M. Peters, Titanium and Titanium Alloys: Fundamentals and Applications, WILEY-VCH, Weinheim, 2003. Matthew J. Donachie, Titanium: A Technical Guide, second ed. ASM international, USA, 2000. 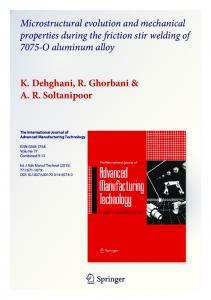 D. Banerjee, J.C. Williams, Perspectives on titanium science and technology, Acta Mater. 61 (2013) 844–879. G. Lujering, J.C. Williams, Titanium, second ed. Springer, New York, 2007. J.P. Davim, Machining of titanium, in: Niknam S.A, R. Khettabi, V. Songmene (Eds. 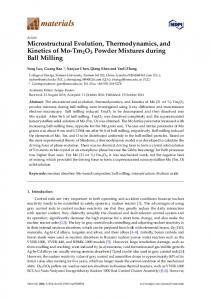 ), Machinability and Machining of Titanium Alloys: A Review, Springer Berlin, Berlin, 2014. Hadley Brooks, Samuel Molony, Design and evaluation of additively manufactured parts with three dimensional continuous ﬁbre reinforcement, Mater. Des. 90 (2016) 276–283. H. Paydas, A. Mertens, R. Carrus, J. Lecomte-Beckers, J. Tchoufang, Tchuindjang. Laser cladding as repair technology for Ti–6Al–4V alloy—inﬂuence of building strategy on microstructure and hardness, Mater. Des. 85 (2016) 497–510. Donghong Ding, Zengxi Pan, Dominic Cuiuri, Huijun Li, Wire-feed additive manufacturing of metal components technologies,developments and future interests, Int. J. Adv. Manuf. Technol. 81 (2015) 465–481. E. Brandl, B. Baufeld, C. Leyens, R. Gult, Additive manufactured Ti-6Al-4V using welding wire: comparison of laser and arc beam deposition and evaluation with respect to aerospace material speciﬁcations, Phys. Procedia 5 (2010) 595–606. Blanka A. Szost, Soﬁane Terzi, Filomeno Martina, et al., A comparative study of additive manufacturing techniques: Residual stress and microstructural analysis of CLAD and WAAM printed Ti-6Al-4V components, Mater. Des. 89 (2016) 559–567. P. Edwards, A. O'Conner, M. Ramulu, Electron beam additive manufacturing of titanium components: properties and performance, J. Manuf. Sci. Eng. 135 (6) (2013) 061016. L.E. Murr, E.V. Esquivel, S.A. Quinones, et al., Microstructures and mechanical properties of electron beam-rapid manufactured Ti–6Al–4V biomedical prototypes compared to wrought Ti–6Al–4V, Mater. Charact. 0 (2) (2009) 96–105. Xiaoli Zhao, Shujun Li, Man Zhang, et al., Comparison of the microstructures and mechanical properties of Ti–6Al–4V fabricated by selective laser melting and electron beam melting, Mater. Des. 95 (2016) 21–31. E. Brandl, F. Palm, V. Michailov, et al., Mechanical properties of additive manufactured titanium (Ti–6Al–4V) blocks deposited by a solid-state laser and wire, Mater. Des. 32 (10) (2011) 4665–4675. R.M. Miranda, G. Lopes, L. Quintino, et al., Rapid prototyping with high power ﬁber lasers, Mater. Des. 29 (10) (2008) 2072–2075. S.M. Kelly, S.L. Kampe, Microstructural evolution in laser-deposited multilayer Ti6Al-4V builds: part II. Thermal modeling, Metall. Mater. Trans. A 35 (6) (2004) 1869–1879. Xipeng Tan, Yihong Kok, Yujun Tan, et al., An experimental and simulation study on build thickness dependent microstructure for electron beam melted Ti–6Al–4V, J. Alloys Compd. 646 (2015) 303–309. Chunlei Qiu, G.A. Ravi, Moataz M. Attallah, Microstructural control during direct laser deposition of a β-titanium alloy, Mater. Des. (2015) 21–30. Yanyan Zhu, Xiangjun Tian, Jia Li, Huaming Wang, The anisotropy of laser melting deposition additive manufacturing Ti-6-5Al-3-5Mo-1-5Zr-0-3Si-titanium-alloy, Mater. Des. 67 (2015) 538–542. Chunlei Qiu, G.A. Ravi, Chris Dance, et al., Fabrication of large Ti–6Al–4V structures by direct laser deposition, J. Alloys Compd. 629 (2015) 351–361. W. Aiyiti, W. Zhao, B. Lu, et al., Investigation of the overlapping parameters of MPAW-based rapid prototyping, Rapid Prototyp. J. 12 (3) (2006) 165–172. J.N. 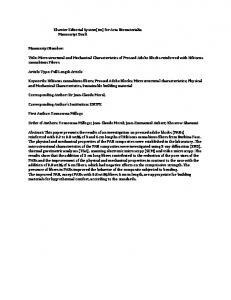 Stavinoha, Investigation of Plasma Arc Welding as a Method for the Additive Manufacturing of Titanium-(6) Aluminum-(4) Vanadium Alloy Components, ProQuest LLC, Michigan, 2012. A.A. Antonysamy, Microstructure, Texture and Mechanical Property Evolution During Additive Manufacturing of Ti6Al4V Alloy for Aerospace Applications, University of Manchester, 2012. Yi Jiang, Ming Liu, Yaohui Lu, Xu. Binshi, Experimental analysis of welding parameters on variable polarity plasma arc pressure, Adv. Mater. Res. 651 (2013) 355–360. E.O. Correa, S.C. Costa, J.N. 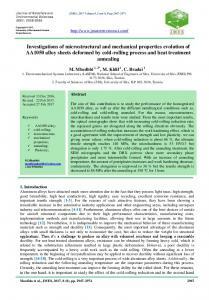 Santos, Weldability of iron-based powder metal materials using pulsed plasma arc welding process, J. Mater. Process. Technol. 198 (2008) 323–329. F.J. Xu, Y.H. Lv, B.S. Xu, et al., Effect of deposition strategy on the microstructure and mechanical properties of Inconel 625 superalloy fabricated by pulsed plasma arc deposition, Mater. Des. 45 (2013) 446–455. F. Wang, S. Williams, P. Colegrove, et al., Microstructure and mechanical properties of wire and arc additive manufactured Ti-6Al-4V, Metall. Mater. Trans. A 44 (2) (2013) 968–977. D.M. 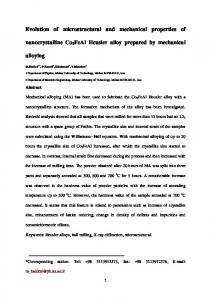 Stefanescu, R. Ruxanda, Solidiﬁcation structures of titanium alloys, in: G.F. Voort, H. James, M.K. Mills, et al., (Eds. ), ASM Handbook, Metallography and Microstructures, vol. 9, ASM International 2004, pp. 116–126. E. Brandl, A. Schoberth, C. Leyens, Morphology, microstructure, and hardness of titanium (Ti-6Al-4V) blocks deposited by wire-feed additive layer manufacturing (ALM), Mater. Sci. Eng. A 532 (2012) 295–307. Bernd Baufeld, Erhard Brandl, Omer Van der Biest, Wire based additive layer manufacturing: Comparison of microstructure and mechanical properties of Ti6Al-4V components fabricated by laser-beam deposition and shaped metal deposition, J. Mater Proc. Technol. 211 (2011) 1146–1158. ASTM B367-13, Standard Speciﬁcation for Titanium and Titanium Alloy Castings, ASTM international, 2013. L.M. Gammon, R.D. Briggs, J.M. 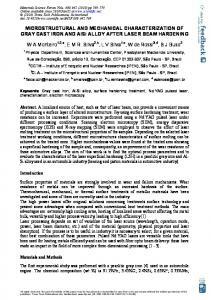 Packard, et al., Metallography and microstructures of titanium and its alloys, in: G.F. Voort, H. James, M.K. Mills, et al., (Eds. ), ASM Handbook, Metallography and Microstructures, vol. 9, ASM International 2004, pp. 899–917. ASTM B381-13, Standard Speciﬁcation for Titanium and Titanium Alloy Forgings, ASTM International, 2013. Xinhua Wu, Jing Liang, Junfa Mei, C. Mitchell, P.S. Goodwin, W. Voice, Microstructures of laser-deposited Ti-6Al-4V, Mater Des. 25 (2004) 137–144. F. Karimzadeh, A. Ebnonnasir, A. Foroughi, Artiﬁcial neural network modeling for evaluating of epitaxial growth of Ti6Al4V weldment, Mater. Sci. Eng. A 432 (1) (2006) 184–190. Beth E. Carroll, Todd A. Palmer, Allison M. Beese, Anisotropic tensile behavior of Ti– 6Al–4V components fabricated with directed energy deposition additive manufacturing, Acta Mater. 87 (2015) 307–320. Y. Hirata, Pulsed arc welding, Weld. Int. 17 (2) (2003) 98–115. K. Balachandar, V.S. Sarma, B. Pant, et al., Microstructure and mechanical properties of gas-tungsten-arc–welded Ti-15-3 beta titanium alloy, Metall. Mater. Trans. A 40 (11) (2009) 2685–2693. D. Rosenthal, The theory of moving sources of heat and its application to metal treatments, Trans. ASME 68 (8) (1946) 849–866. Sindo Kou, Welding Metallurgy, second ed. John Wiley & Sons, New Jersey, 2002. T. Ahmed, H.J. Rack, Phase transformations during cooling in α + β titanium alloys, Mater. Sci. Eng. A A243 (1998) 206–211. 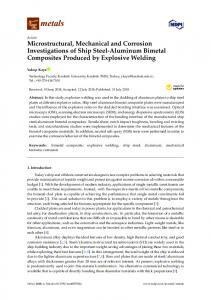 Baufeld Baufeld, Omer Van Der Biest, Steven Dillien, Texture and crystal orientation in Ti-6Al-4V builds fabricated by shaped metal deposition, Metall. Mater. Trans. A 41A (2010) 1917–1927. B. Baufeld, O. Van der Biest, R. Gault, Additive manufacturing of Ti–6Al–4V components by shaped metal deposition: microstructure and mechanical properties, Mater. Des. 31 (2010) 106–111. 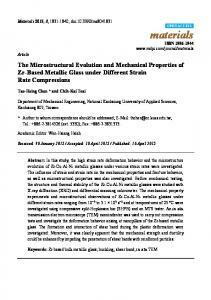 Report "Microstructural evolution and mechanical properties"